Get ready Sydney: one month from today, Aussies will be able to see, do, taste and try everything that Carnival Spirit has to offer when Australia's newest and largest cruise ship arrives into her new home of Sydney Harbour for the very first time. As soon as she docks down under on Wednesday 17 October, Carnival Spirit will receive the finishing 'Aussification' touches ahead of her first official voyage to New Caledonia on Saturday 20 October. 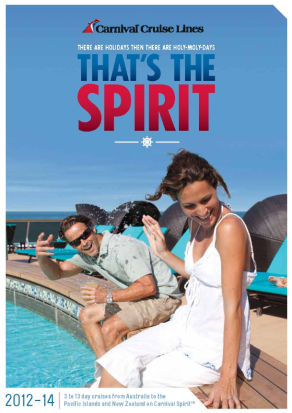 For more than 12 months, Carnival Spirit has undergone major Australian modifications including the installation of the jaw-dropping Green Thunder, the steepest and fastest waterslide at sea, and Serenity, the ginormous child-free retreat with panoramic views of the big blue. Before she takes her first 2,680 Australian passengers to sea, no Aussie stone will be left unturned. Carnival Spirit will be kitted out with Australian power points, be ready to take Australian currency, and American-style 'slot machines' will be swapped out for good old pokies. Perhaps most importantly, new coffee machines will be added, so the newly trained baristas get that flat white just right. Jennifer Vandekreeke, Director Carnival Cruise Lines Australia, is thrilled Carnival Spirit will soon be sailing in to her new Sydney home. "We've been working on this for a long time and in just one month, the latest and greatest additions to Australia's first Carnival ship will be here for all to enjoy. Most people cruising on Carnival Spirit are going to be new to the experience, and with over 45 onboard activities each day, there will be something to suit everyone's taste, for a holiday that's as fast or as slow as you like. This time next month, guests will be thundering down the slide or sipping mojitos in a hammock on Serenity – and that's exactly where you'll find me!" For Aussies looking for a holiday experience that goes from zen to adrenaline and every speed in between, Carnival Spirit offers a wide range of unique opportunities and experiences unavailable anywhere on land or sea. 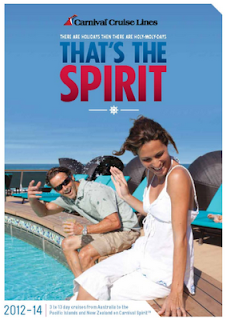 Carnival Cruise Line's new 2012-2014 brochure will be available to order at Brochure Flow this Friday.